A stimulating historical reader on the spiritual dimension of work, assembled as an anthology of fine writing from classical times to the present, including Eastern, Western, and native viewpoints. The selections are arranged historically, “moving as human culture moves,” until, Thorpe writes, “we reach, in this wandering way, the modern city, with its associated industries and professions, which bear so little resemblance to the life that humans have lived for thousands of years.” This fine anthology challenges us to restore the age-old meaning that work can offer. "Thorpe's ambitious anthology of writings stretches back to the Navajo creation myth and legends of Athena's weaving and then forward to include examples from 19th- and 20th-century greats, such as Walt Whitman's gleanings in "Song of Myself" and William Carlos Williams's restful poem about "The Corn Harvest." The book contains essays by present-day sages, including Pam Houston, Louise Erdrich, Thomas Moore, Studs Terkel, Thich Nhat Han, Gary Snyder, Kathleen Norris, and Linda Hogan. Every contribution speaks to the deeper dimensions of work--how does one earn a living and stay true to his or her creative yearnings? How do seemingly mundane human tasks contribute to the greater good? These questions are answered in many eloquent and surprising essays." 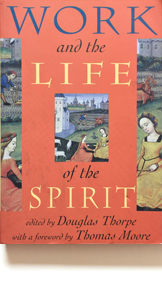 Douglas Thorpe is the author of the critical study A New Earth. He teaches at Seattle Pacific University and is program director of the Center for Spiritual Development.